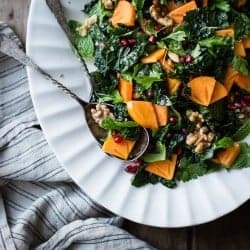 Marinated in a toasted cumin maple dressing and tossed with a mess of herbs, pomegranate, persimmon, and walnuts, kale salad never tasted so good. I’m pretty sure that, if left to his own devices, Jay would eat salad for every meal of the day, every day of the year, with the occasional burrito thrown in for variety. This is a very good thing, because I hate making salads, but I like eating them and appreciate their healthfulness. Why do I hate making salads so? I don’t really know. But before Jay came along, I would buy bags of pre-washed greens which would rot in the crisper before I could force myself to throw some bottled dressing on them and call it a meal. Jay’s salads are always the same: big bowls brimming with torn lettuces, crunchy vegetables, vinaigrette, some crumbled feta; simple, healthy, and delicious. He makes one, without fail, every day, which we usually accompany (at my insistence) with other food. 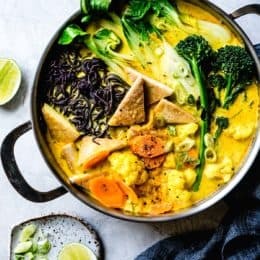 And though I sometimes whinge about the big bowls of greens, particularly on cold or drizzly days, I love knowing I’ll get a dose of fresh veggies without having to do any salad-making of my own. In general, Jay is an equal-opportunity salad-eater, with one glaring exception: kale salad. The man won’t touch it with a ten-foot pole. “Kale salad,” he’ll say, curling his lip in disgust, whenever the subject comes up. This was the case last week, when, after styling this salad with Sarah, I came home with two huge bags full of fresh herbs. 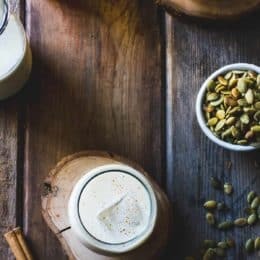 I have a pet peeve about herbs: the ones you need a lot of at a time – basil and mint – come in tiny bunches, whereas the herbs that are only called for a tablespoon or so at a time in recipes – cilantro, parsley, dill – come in giant shrubberies that linger in the crisper, becoming increasingly black and slimy, before being shoved into the compost amidst a flurry of shame and self-disgust at having let so much food go to waste. Jay loves toasted cumin, so that was a no-brainer. He complains of kale being tough and fibrous, hence the genius and well-trodden solution of massaging the greens with acid to soften the little buggers up and break down the walls of cellulose that trap moisture. This makes the kale tender and juicy, allowing it to absorb the other flavors. Kale is bland – herbs to the rescue. 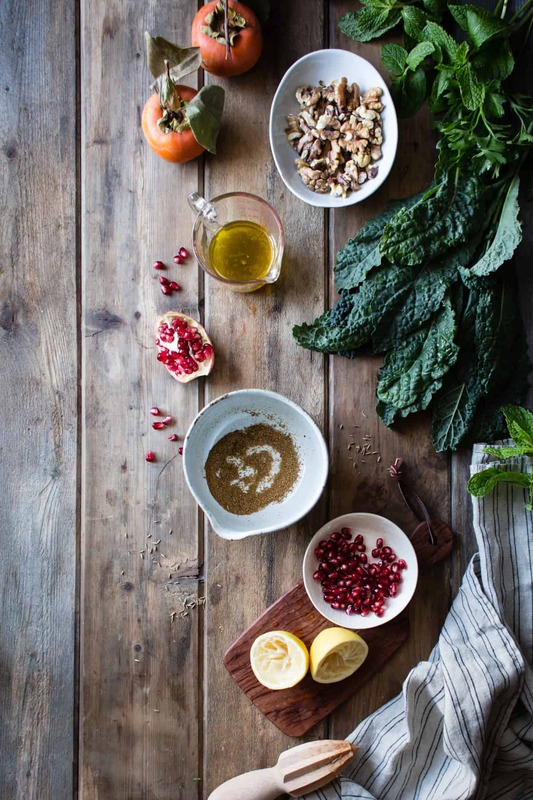 Kale is bitter – sweet persimmons, pomegranate, and a drop of maple syrup will fix that. Kale salad is boring – try saying that with a mouthful of bright herbs, tangy dressing, and toasty walnuts. My plan worked, to some extent. There were no leftovers as we devoured the whole thing. 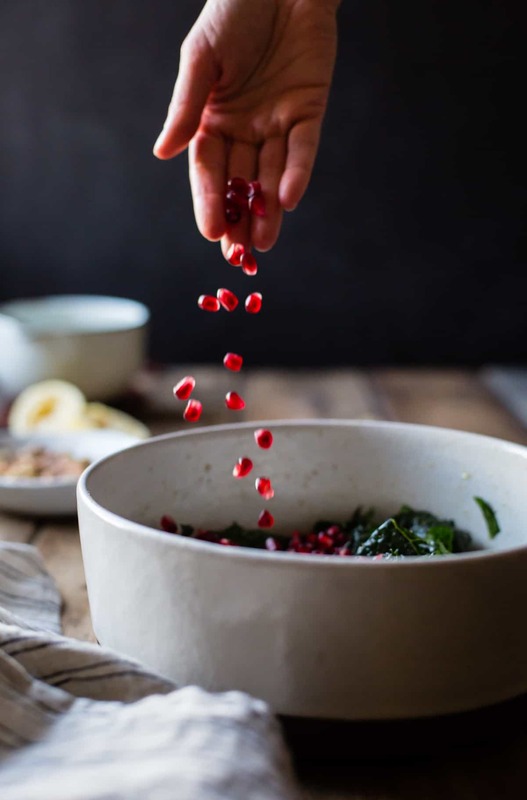 Through mouthfuls, Jay mused over how bright and clean the herbs tasted, and how the salad would make a good accompaniment to a holiday meal with its penchant for cutting through richness like a honed knife. Kale salad: 1, kale salad haters: 0. But the joke was on me. “Hey, when are you gonna make that kale salad again?” Jay now asks. 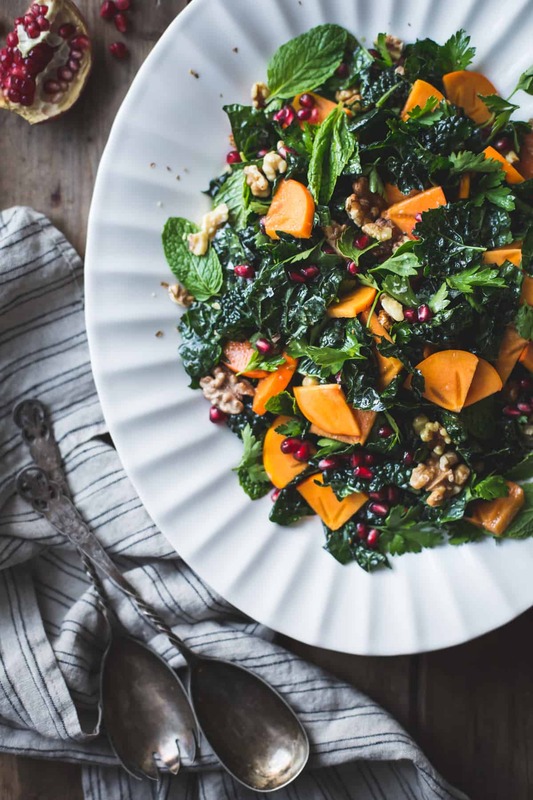 Marinated in a toasted cumin maple dressing and tossed with a mess of herbs, pomegranate, persimmon, and walnuts, kale salad never tasted so good. Goat cheese optional. With inspiration from Yummy Supper. Place the cumin in a small, dry skillet and toast over medium heat, shaking frequently, until fragrant, about 2 minutes. Let cool, then grind in a spice grinder or mortar and pestle. 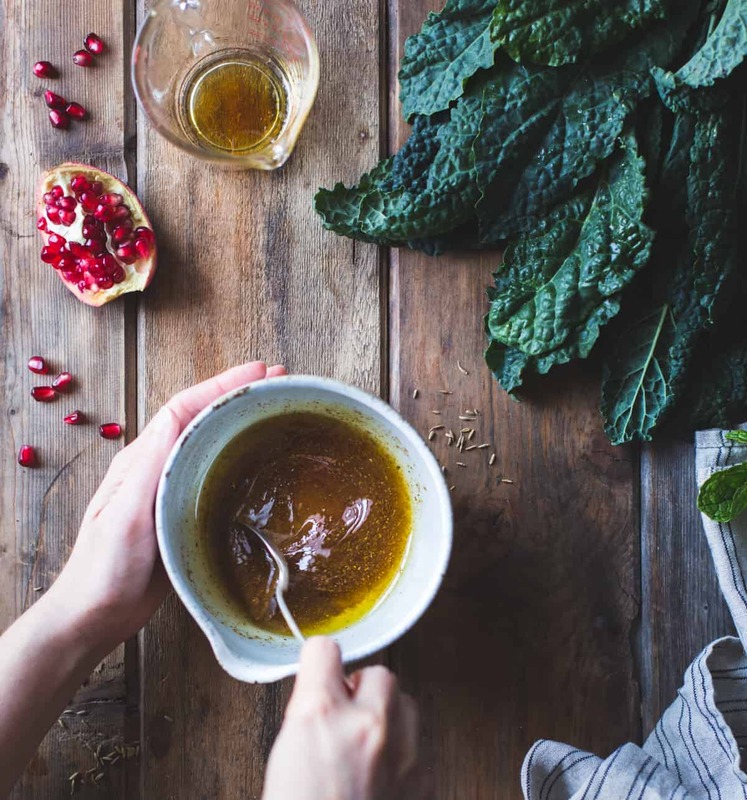 In a bowl or measuring pitcher, whisk in the olive oil, lemon juice, maple syrup, and salt. 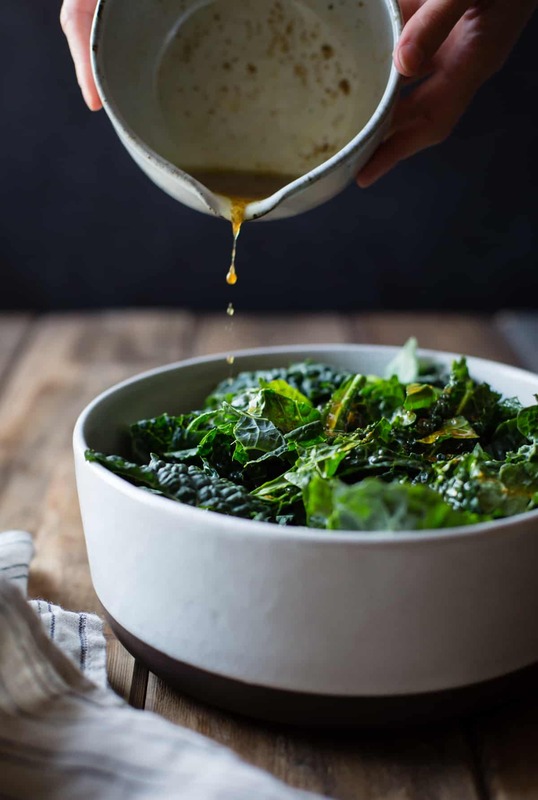 Place the prepared kale leaves in a large bowl and toss with the dressing, using your hands to squeeze and squish the kale; this helps to make it tender and absorb the dressing. Set aside while you prepare the remaining ingredients, at least 5 minutes or up to 30 minutes. Add the herbs, nuts, and fruit to the bowl and toss well to coat. Toss with crumbled cheese if using and serve immediately, or chill for up to several hours. Ha! I love that story, and great point about the sizes of herb bunches! I’m obsessed with cilantro so I’ll always use it all, but can almost never make it through a bunch of parsley. Almost every time I need basil at the store, it’s not only a tiny amount but is only sold as part of a LIVING PLANT, which I just can’t seem to sustain. This salad looks amazing. 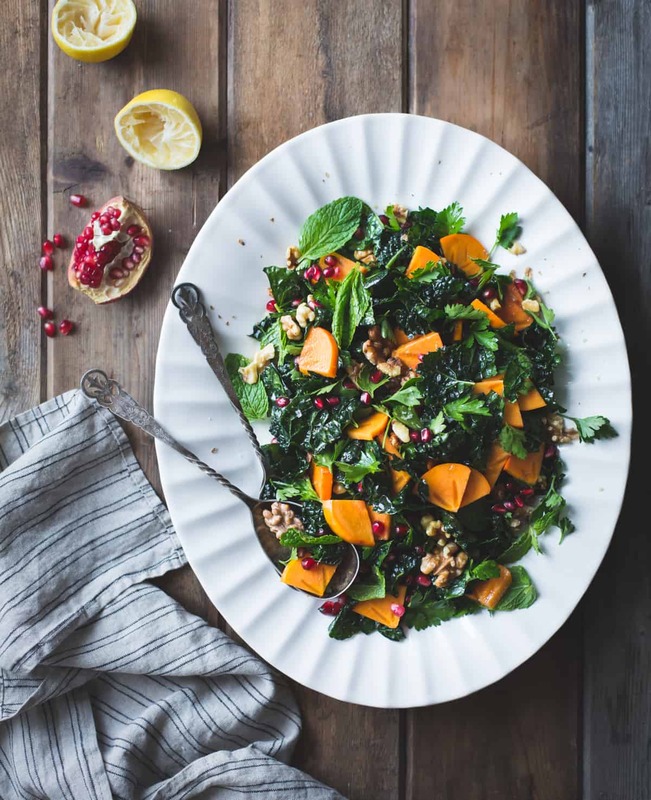 Im all over kale at the moment as its only become a ‘thing’ here in our corner of the world and this salad looks delicious. I love how it wilts when you douse it in vinaigrette. I tend to make the same vinaigrette all the time so I want to step out my zone and give a few other s try. beautiful pics as usual. LOVE this story, Alanna…and decision over holiday salad SOLVED in one, fabulous, Bojon entry. Molte grazie!! love how you conquered kale and all its faults/unfriendly bits! and i could stare at that pomegranate picture for hours- the color is fantastic, and it’s so clear for something in motion! Hah! LOVED this story!! I had no idea Jay was such an enthusiastic salad maker (or vacuum-er, I am SUPER jealous). 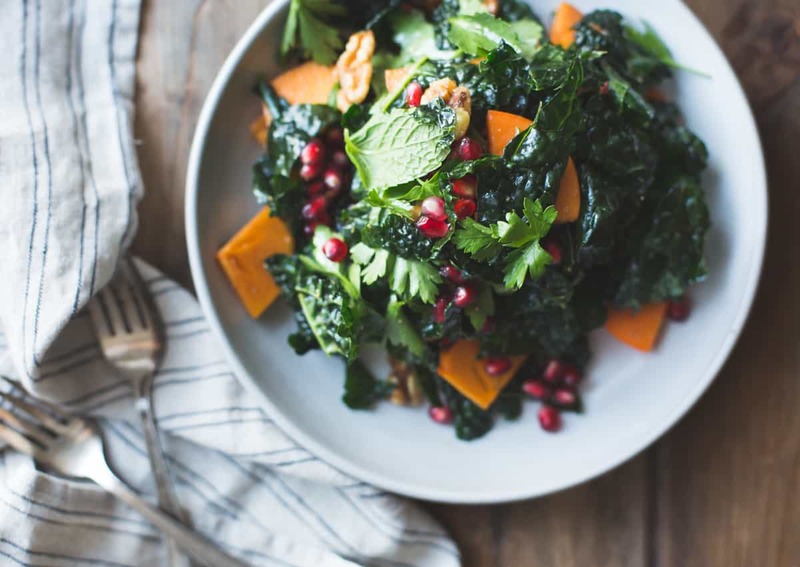 This salad sounds so fabulous–my family is flying into town for Thanksgiving and we’re preparing to cook our entire meal in my teensy apartment kitchen. I’m definitely putting this salad (and your pecan pie (!!!)) on the list of contenders! So excited to try this!! You had me at Maple-Cumin Dressing. This salad is perfectly suited to my tastes. Thanks for such a beautiful creation. 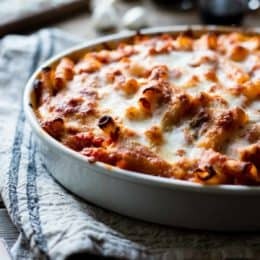 I pinned so many of your gorgeous photos as I scrolled my way down to the recipe. So beautiful! Ha, what a funny story! I hate making salad too (washing lettuce = bane of my life) but I love eating salad, so I make the sacrifice. 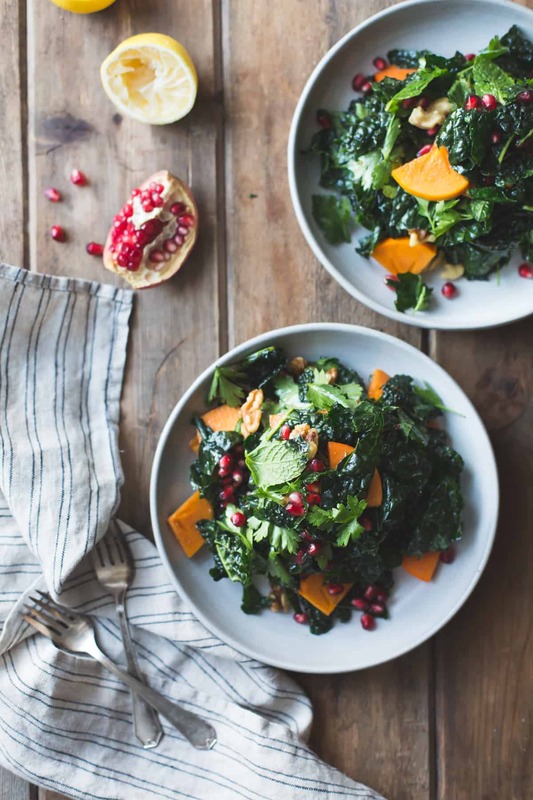 I just had a fab persimmon-pom salad last week and have been thinking of it ever since. The maple-cumin dressing sounds so good! 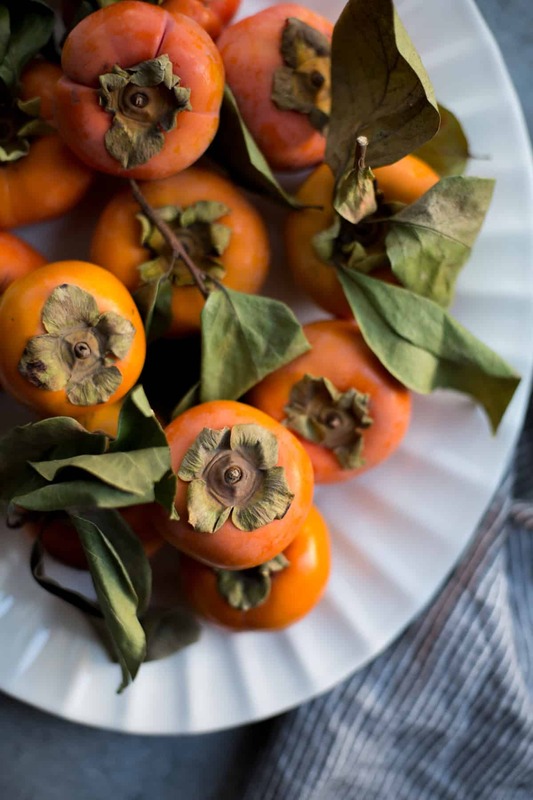 I can never get enough of persimmon recipes this time of the year so I am glad you shared yours! 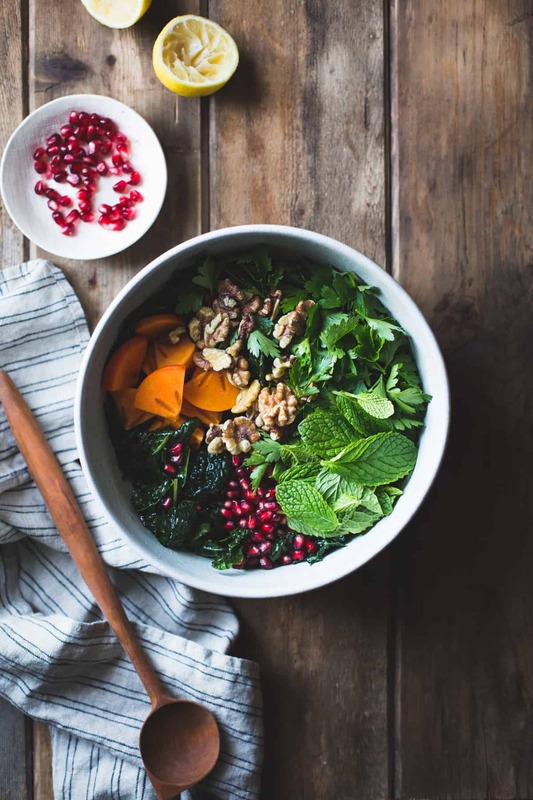 I really love the colors of the salad and can imagine it with different nuts and herbs as well or maybe as a nourishing bowl with brown rice or quinoa. Thanks a lot for sharing! Oh man, Alanna, have I told you that when I become a millionaire the first position I’m hiring is a salad maker? Sincerely. I shall be the first person on Craigslist to ever ask for someone who doesn’t mind washing and prepping vegetables. (On second thought, I bet someone’s asked for that.) Some people want chauffeurs or makeup artists or butlers. ALL I WANT IS A SALAD I DON’T HAVE TO MAKE. Definitely a salad that can win a sceptic over. Thanks for sharing. It’s gorgeous. 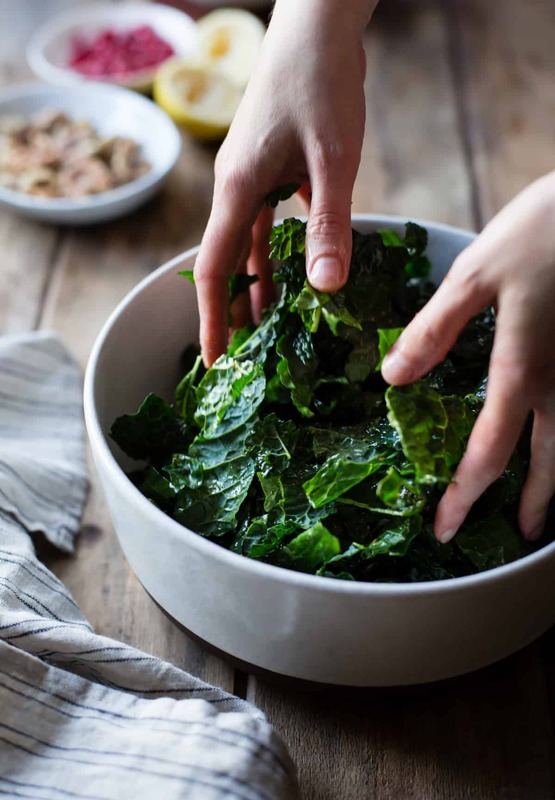 Dino (lacinato) kale and massaging them is *totally* the answer to kale-haters’ hate, I agree – although I do always secretly hate the phrase “massaged greens,” haha. I was also a kale skeptic for a long time but some of Deb Perelman’s kale salads really won me over, and now I’ve found myself even ordering kale salads. And loving them. I can’t help it! As always, gorgeous photos, and your blog will always remain top-tier to me. Also, I didn’t know you could make kale softer/absorb flavor with the addition of acid! This is so good to know! Kale salad is actually one of the kinds I actually like- so fresh and crunchy. And your flavor combo is awesome! We celebrated our Thanksgiving two days early with our daughter home from college. We’ve served this salad twice already (! ), and my daughter exclaimed that she wants to eat this salad every day for the rest of her life! My husband raved, too. The first time we used parsley, cilantro and mint, two fuyus, and feta. Next time around we had only one fuyu remaining so used a pear along with the fuyu. All delicious. This beautiful salad has earned a permanent place on our Thanksgiving menu! Thank you! Best Christmas salad ever! This is my new goto salad recipe. Thank-you. By December 24th, all the fuyus were sold out, but it was still a hit with red comice pears. Delightful! Aw man, I hate when the persimmons go away! But I’m so glad y’all liked the salad with pears – yaaayyy!